I have been watching Star Trek since I had to sneak down the hall to watch, when I should have been in bed. I saw bits and pieces of the first run on the old B&W. When it went into syndication I saw it all, and loved what I saw. I found like minds in school and gradually turned into a full blown Trekkie. Star Trek, born of the Cold War, was a vision of a bright future where we didn't have to hate, where reason and peace could prevail. Everywhere around me I saw fear and no hope for a bright future. I clung to Star Trek for all it was worth. Star Trek lead me to read Science Fiction, and as a result as deeply enriched my life. For years the urge to write has been with me, but the ability to think out an entire plot has not. I wanted to do Trek, but as yet I had not matured enough to do it. I read the pro novels, I read the Kratih 'zines, and read just about everything Trek, and otherwise, I could get my hands on. Then I got my hands on the work of one Jay P. Hailey. Something in his simply written stories struck a cord, and I read them obsessively until I had read them all. The pressure built, and my own work burst forth. So you have Hailey to thank (or blame) for the results. What Trek do I like? Well, that would be opening a can of worms. What some people like, others do not (see above). If you want my opinions on Trek shows and movies, join the TrekCreative mailing list, and you will get plenty of opinions, and an opportunity to express your own. I do recommend that anyone who likes Trek should broaden their horizons with other Science Fiction. Doubtless you will find your favorites, or know them already. I have found enjoyment in the writing of these authors, their names and work have stuck with me. Fan fiction, as with any writing is a matter of taste, one man's meat being another man's poison. 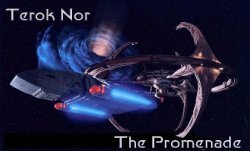 I have listed my own work for reading or download, and I have links to other sites with Star Trek fan fiction as well. Try it all, you might find something you like. Subscribe to the "TrekCreative" mailing list. This is an e-mail list that is sent to all subscribers. Anything posted to the list will be received by all subscribers. "TrekCreative" is for those persons that enjoy Star Trek, Trek fan fiction and writing fan fiction. While Star Trek is the primary theme, all Science Fiction is welcome. Send e-mail to TrekCreative Subscribe. I recommend this option rather than the website. This site and all its contents are Copyright 1997-2018 inclusive by Garry Stahl and Susan Stahl except where otherwise indicated. Star Trek(TM), & by CBS Pictures. All Rights Reserved. Star Trek is a registered trademark of and all characters and related marks are trademarks ® of CBS Pictures. DISCLAIMER: THIS WEB SITE IS NOT PRODUCED OR ENDORSED BY CBS PICTURES. ANY OF PARAMOUNT'S COPYRIGHT MATERIAL APPEARING ON THIS SITE COMPLIES WITH FAIR OR ACCEPTABLE USE PRINCIPLES ESTABLISHED IN U.S. AND INTERNATIONAL COPYRIGHT LAW FOR THE PURPOSES OF REVIEW, STUDY, CRITICISM, OR NEWS REPORTING. Paramount owns copyrights to "Star Trek" and can legally do anything the executives want with it, but the fans are not obligated to follow along with something that violates the image of "Star Trek" they hold. Paramount is guilty of a textbook example of failure to understand its customer base and the resulting failure to provide "products" that serve the needs of the customer.